Today Mina had a piano recital to which we all went to, including Grandpoo, Oma, Lolo and Lala. She played beautifully and I thought we’d go out to dinner after. Well, that plan fell apart pretty quickly as Lala and Lolo were leaving for Alaska the next morning, and our celebrant, Mina, decided she’d rather go to Lala’s house. Uh, okay. So that left Grandpoo, Oma, Benji, me and Papa. 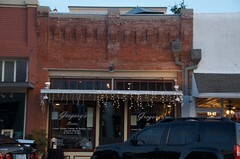 I’ve been wanting to go to Gregory’s Bistro ever since we realized that despite their website’s announcement of being permanently closed, they’ve been open since April! We met Grandpoo and Oma there and were seated after the server put a table together for us. We all ordered drinks and she brought a small glass of water for Benji, which always makes me a little nervous. He and I did fight over that glass a few times, but thankfully, no spills and no breaks! We ordered appetizers and Benji obsessed with his water glass. The cheese plate came out pretty quickly. 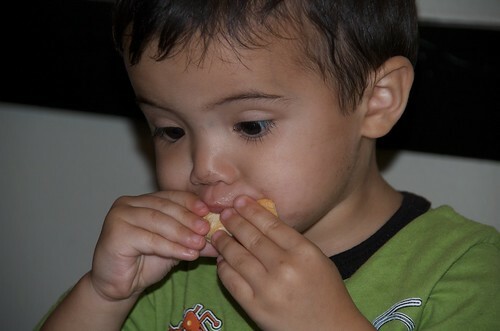 Benji, surprisingly, did not want the strawberries and instead opted for the Parmesan cheese and bread. Just as he was becoming bored with that, our server offered up some bread and butter for him. This was where the money was at and he was content the rest of dinner. 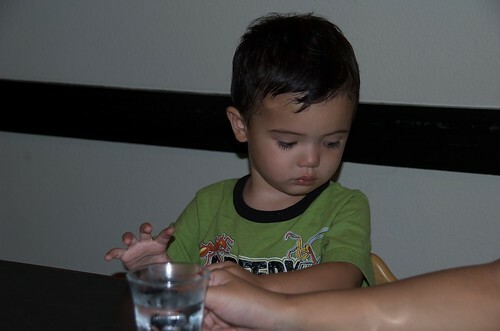 We ordered dinner and chatted while Benji, at times, sang songs to us including the Itsy Bitsy Spider. All the other restaurant patrons were seated upstairs, so he wasn’t bothering anyone and, in fact, the server and chef/owner told him that they enjoyed his singing! 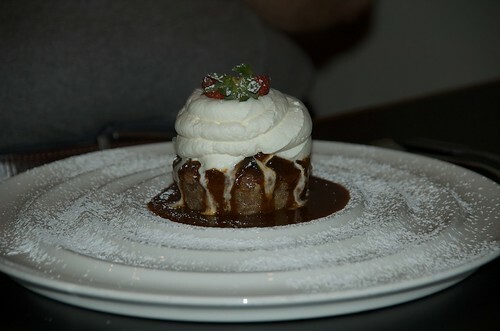 After a pretty uneventful dinner, we ordered dessert, which was as excellent as the rest of our meal. American-French cuisine (well, I only say French because the owner/chef is French, maybe Continental is a better term)? We ordered mussels in a curry sauce and the cheese and strawberries plate as an appetizer. I thought the mussels were fantastic. All were nice and open, no shells broken and the broth had a nice coconut/curry flavor. The cheese plate came with hearty portions of brie, parmesan, goat cheese and one other cheese - I can’t recall the name! These are served with a sun dried tomato pesto, toasted thinly sliced bread, and strawberries. The appetizers were a nice size and shareable. I ordered the Lamb Chops (they are served with coucous, but I replaced the couscous with the citrus risotto). My lamb chops were perfectly prepared (medium rare) and seasone very nicely. I must have thought the risotto was fine since I ate all of it, but I don’t know that I would prefer to have grapefruit in my risotto! I would definitely order this dish again! Grandpoo and Oma each had the sea bass served atop the citrus risotto and with a roasted asparagus. They liked each component of their plate and this came highly recommended by our server. For the record, they really enjoyed the risotto (as did Ogre when he tried mine). The gave high remarks to the roasted asparagus as well. The fish was very buttery (although I’ve never met a Chilean Sea Bass I didn’t like). Ogre ordered a Pork Chop served atop a bed of goat cheese penne pasta. He said the sauce on the noodles was a little spicy (which he likes, but couldn’t share with Benji who wanted some “doo doos”). The pork chop was very thick and meaty, but was not tough at all. For dessert, we had creme brulee, strawberry cream cake, and their bread pudding. 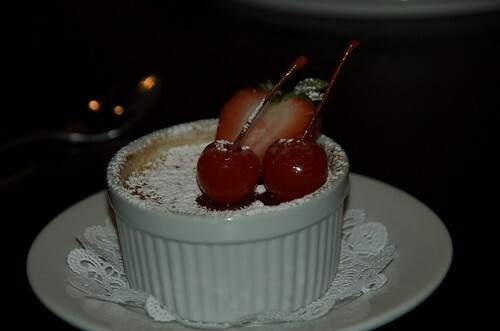 The creme brulee, I’d say was average -a little runny on the bottom so the consistency was not there, but tasted fine. The bread pudding did not have raisins (which Ogre and Grandpoo were both pleased about) and tasted better than average, but according to Ogre, the bread pudding at Rick’s Chop House is better. 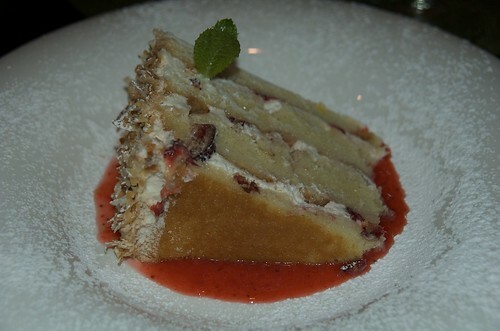 Everyone who tried the strawberry cake was also complimentary of it. Service was pretty good. She was informative and attentive and, in fact, was pretty attentive to Benji’s needs…asking if she could refill his drink, offering him bread and butter. The tempo is appropriate for the restaurant but may be a little slow with kids. No kids menu, no kids activities, not very laid back, but they were nice to Benji…I don’t know if they would have been nice if he had been nice!! I think it’s better to go to this one without the kids, but if you were to bring them and they behave okay, I think it would be fine.